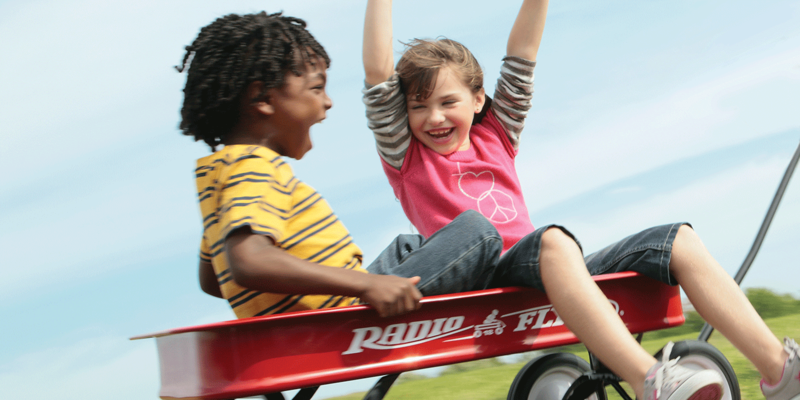 Radio Flyer has sold more than 100 million wagons. It was 1917, and Antonio Pasin had what you might call a product line problem. 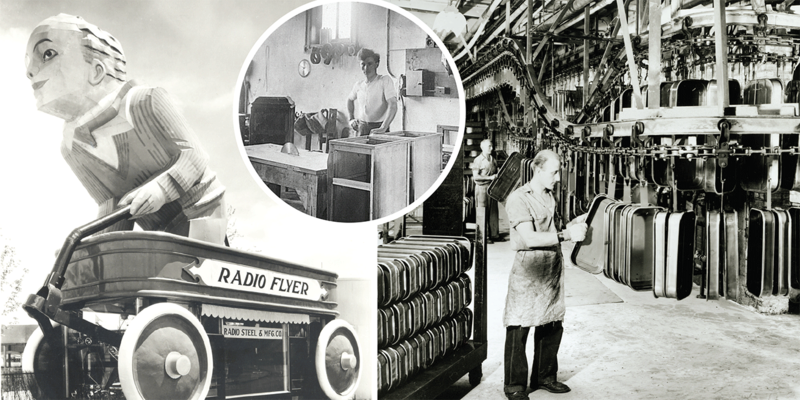 The 19-year-old carpenter had emigrated from Italy three years earlier and set up a small woodworking shop to make phonograph cabinets. But phonograph cabinets were not what Pasin was selling. To help him lug his heavy tools around, the fresh-faced Chicago carpenter had also constructed some heavy-duty wagons—those were what customers were asking to buy. Undeterred, Pasin reoriented his company, scuttling the phonograph cabinets and going into the wagon business. Opening a woodshop just before WWI, Antonio Pasin (center) made his first wagons out of wood. With the coming of the Great Depression, Pasin saved money by making wagons from stamped metal on a Detroit-style assembly line (right). Though he lacked a formal education, Pasin was a gifted marketer—and he proved it in 1933 when he borrowed $30,000 to build this 45-foot-high wagon (left) at the Chicago World’s Fair. The gamble paid off, and despite the lean times across the country, Americans bought 1,500 Radio Flyer wagons a day. That was 100 years ago. 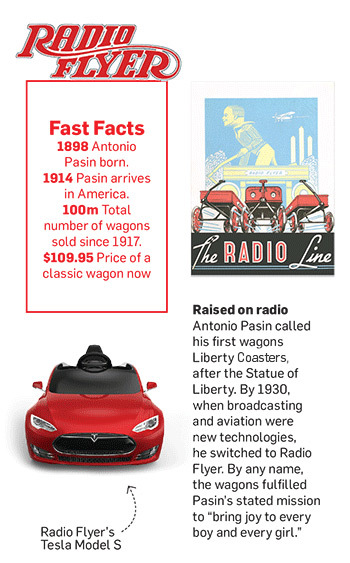 Today, the Radio Flyer wagon—the name given to the stamped-metal model Pasin began mass-producing in 1930—remains as American a product as the Ford in the driveway and the iPhone in the back pocket. Since that fateful day when Pasin decided to start manufacturing wagons, his company has sold north of 100 million of them. But with kids having their pick of diversions from video games to drones to everything on the web, the big question is: Still? Kids still play with wagons? Not that it’s all been smooth asphalt for Radio Flyer. In the early 1990s, the brand took a hit when Sears ended its contract for steel wheelbarrows, and then plastic wagons imported from the Far East began eroding its market share. The competition forced Radio Flyer itself to switch to plastic and diversify into tricycles and nontraditional wagons (with seats, canopies and dune buggy tires). There’s even a Radio Flyer Tesla Model S for Kids, which features working headlights and an MP3 sound system. This past Saturday, Radio Flyer doubled down on its message that a wagon, and a little imagination, can take kids anyplace they want to go. In Chicago’s Lincoln Square neighborhood, the company opened a pop-up Kid’s Travel Agency. Inside, actor/travel agents booked kids to phantasmagorical locales—”destinations reachable only by imagination”—including Flipping Pancake Island and Octopus Shiny Treasure Bay, then walked them over to some waiting wagons to show them how to get there. 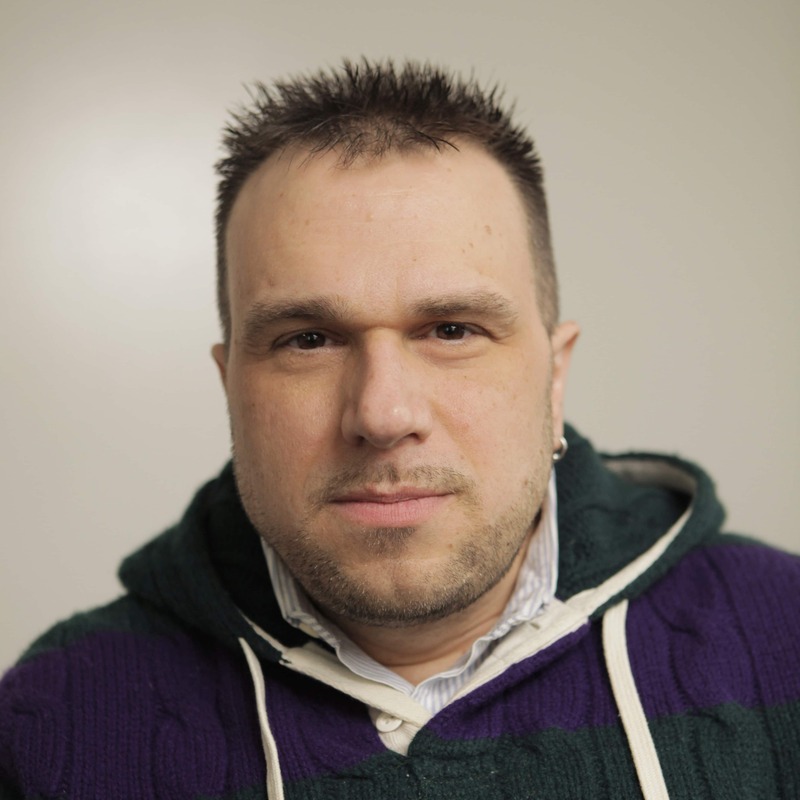 A spot created by FCB Chicago (watch it below) captured some of the proceedings. If you happened to miss the pop-up travel agency, take heart: Radio Flyer has an online customization feature that lets kids build and equip their wagons from scratch, adding seat pads, drink holders and umbrella canopies—just the sort of equipment that any trip to a land of unicorns and fire-breathing dragons clearly requires.